2016 has been an amazing year of photography for me with many new destinations on the list and lots of flexibility within my travels. For those that don’t know who I am, I’m another one of those crazy Instagrammers but I’ve done something unique and specialized in tourism, so I spend my days roaming the world and sharing my stories on Instagram. Today I’m writing about a recent trip to Ireland and Northern Ireland and sharing some travel tips, photography pointers and stories of my mishaps. Griannan Of Aileach, This is me! Taken as a selfie with a tripod and remote on the Wild Atlantic Way in Ireland. Ireland was an exciting job for me as I was working directly with the Australian office of Tourism Ireland and I somehow managed to convince them to give me a car and let me loose in their country for a week. Often on my Instagram jobs the program is more structured, but flexibility definitely buys me more freedom to shoot and I find my work is better for it. 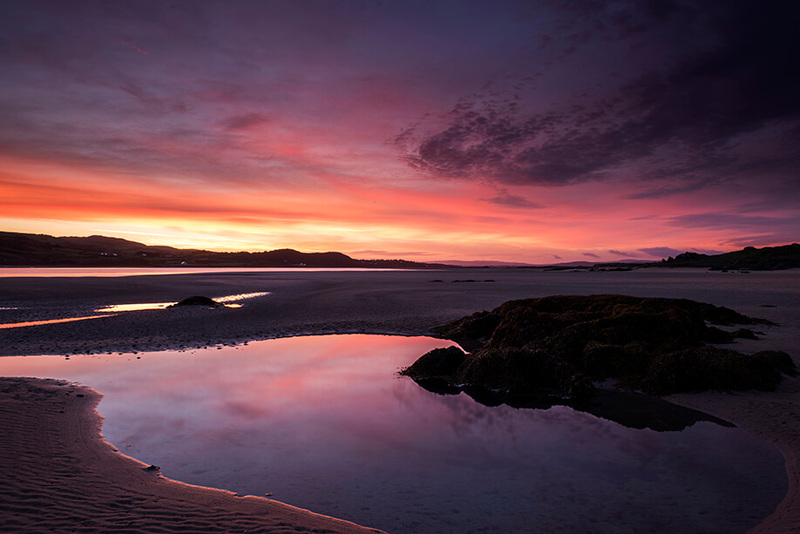 My Irish journey began at Fanad Head on the west coast where I picked up the Wild Atlantic Way and drove all the way north to Malin Head before jumping onto the Coastal Causeway Route in the northeast and wrapping up in Belfast. 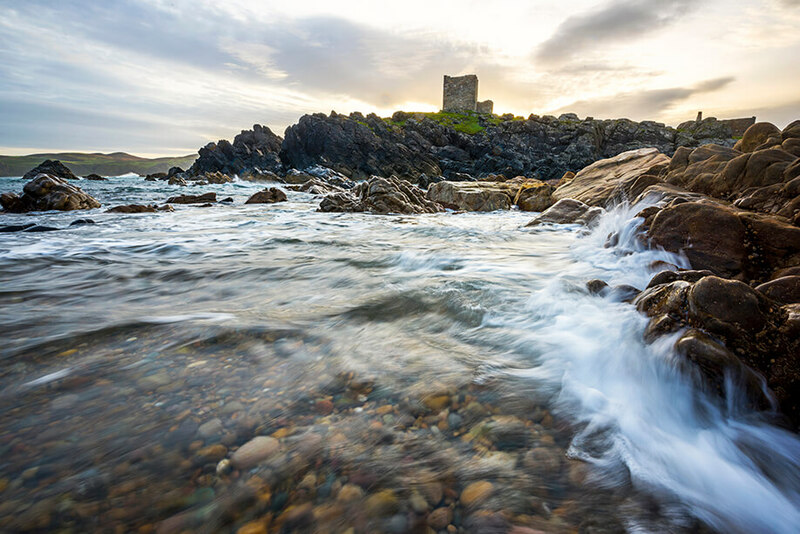 Carrickabraghy Castle, I was after a semi-slow shutter speed to slow down the water here, so I had my tripod nice and low and tried out my yoga moves. As with a lot of my work I threw myself in the deep end. I approach my work in travel differently from a lot of other people and genuinely attempt to experience the destination as a tourist would. I don’t pre-plan, I shoot rain, hail or shine and I’m often running late, missing the light or lost on the side of the road. In short, I am real people. Haha. My first near-disaster was when I almost missed the most spectacular sunrise of the trip after taking a wrong turn on my way to Carrickabraghy Castle. (BTW: do not rely on your GPS in Ireland.) I ended up in someone’s driveway before literally just heading towards the pretty colours, jumping a fence and traversing quicksand to get to a big puddle. You would be surprised how well a puddle can shoot at sunrise. Doagh Famine Village Puddle, You would be surprised how well a puddle can photograph in a pinch. Another habit I’ve got into is shooting on the side of the road. Although I love hitting the tourist hot spots, I often find some of my favourite scenes by just driving around and I’m sure that most travellers are the same. Once I had left the Wild Atlantic Way I got onto the Coastal Causeway Route, which has so many incredible landmarks, attractions and ruins to stop at. 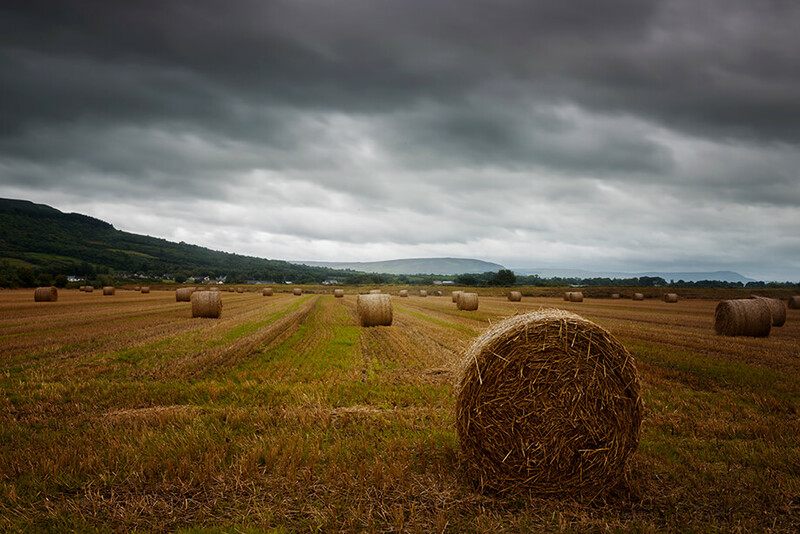 Yet here I was, illegally parked and trespassing on a farmer’s land to get this shot of hay bales. I used filters throughout the trip, so as with most of my photography in Ireland this picture was shot on the tripod. Here I stacked two graduated neutral density filters to darken the sky and create a dramatic scene. Having a tripod meant that I could slow my shutter speed right down. Causeway Coastal Route Hay Bales, Plenty of depth of field and graduated neutral density filters for a dramatic landscape. 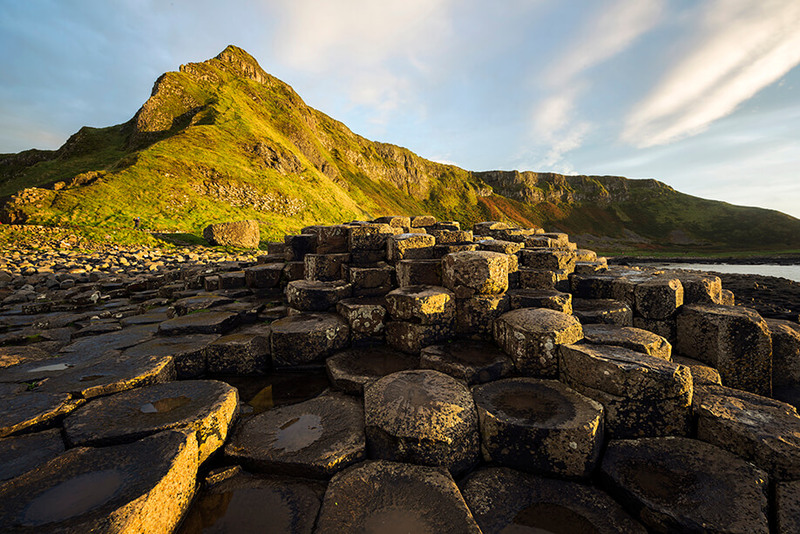 My first major stop on the Coastal Causeway Route was the Giant’s Causeway, which is a UNESCO World Heritage site that meets criteria in both the cultural and the natural categories. I had done absolutely no research on the area and literally didn’t even know what it looked like when I arrived in the early afternoon. Since I had time to spare I jumped on an audio tour, just to get a bit of background history on the site, and I’m so glad I did. My Irish guide taught me loads about the natural phenomena of the area but even more interesting were his folklore and tall tales. 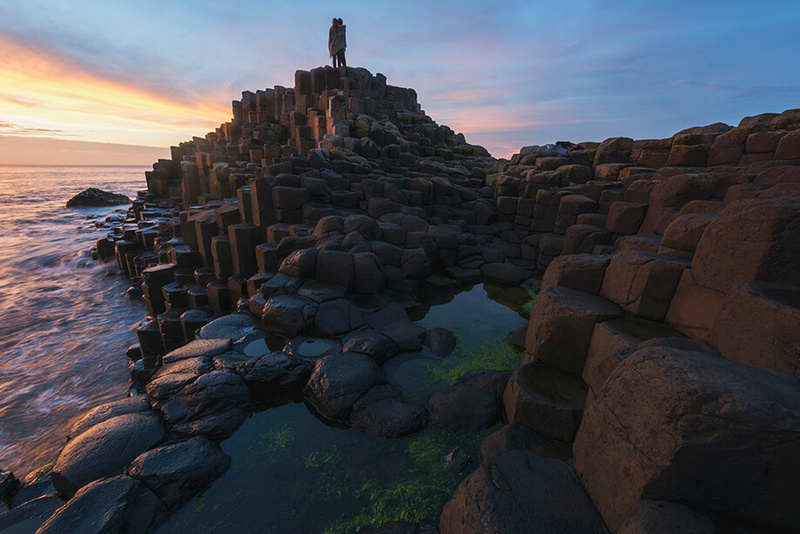 Giant’s Causeway Low Perspective, The approximately 40,000 basalt columns that make up the Giant’s Causeway create an unlimited number of compositional opportunities for photographers. After I had finished my audio tour and learnt all about the Irish giant Finn McCool, I had roughly four hours to spend shooting the area. Although it was quite busy all afternoon, the visitors started to drop off around half an hour before sunset. As the clouds cleared and the sun sank into the ocean I was one of only a dozen people still around, and by this point I had already chosen a handful of compositions that I wanted to photograph with no people and better light. Obviously a tripod was very important at this stage as the light was fading fast. Giant’s Causeway Couple, Taking a low and wide angle I was able to use the basalt columns as foreground interest. Add a touch of stranger stalking and you’ve got yourself a shot. 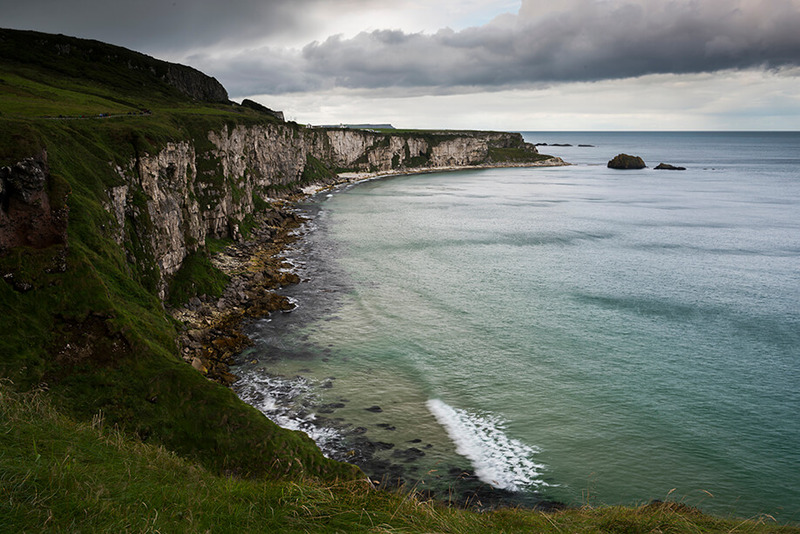 Another suggestion that was given to me was a quick stop at the Carrick-a-Rede Rope Bridge – although, realistically, I don’t do anything quickly. Since it was a rainy day in Northern Ireland I was completely decked out in waterproof gear and even my camera had a rain jacket. It was a good thing too, as the rain came and went throughout my visit to this area. The rope bridge itself is quite stunning but the views of the limestone cliffs on the hike in and out were what really grabbed my attention. Since I wanted to capture the dark skies I opted to use graduated neutral density filters and a polarizer. After lots of stopping and starting and waiting out the rain I did manage to finally cross the rope bridge, and I would definitely recommend a visit because the view on the other side is worth it. Carrick-a-Rede Bridge Cliff Walk, A graduated neutral density filter allowed me to keep all that great, moody detail in the sky. One of my final photography locations on this Ireland road trip was the Dark Hedges and I felt like I had saved the best until last. I definitely needed to shoot with a tripod in here, as the chief word is ‘dark’. 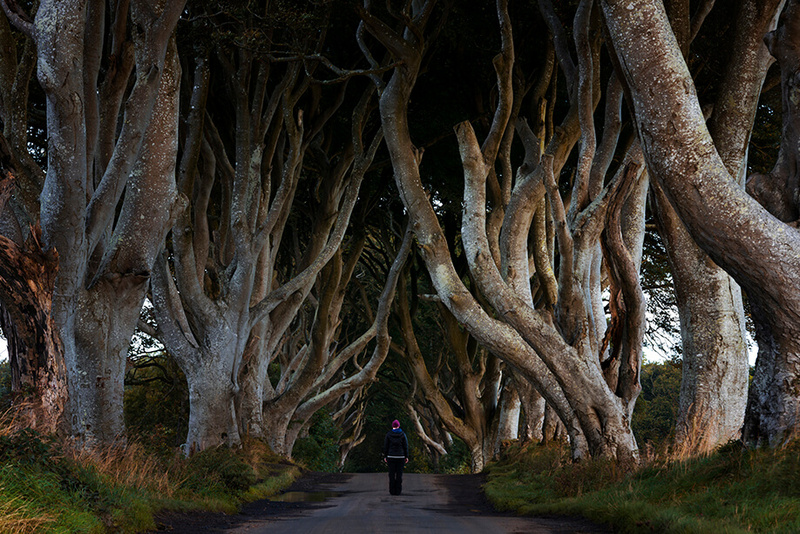 The Dark Hedges is a popular photography spot thanks to featuring in numerous movies and recently Game of Thrones, but I arrived very early and managed to beat the crowds. Dark Hedges Selfie, Having the right gear with me at all times means I have so many options when it comes time to shoot. A tripod, lenses of various focal lengths and great filters allowed me to capture Ireland just as I wanted to. So there you have it. 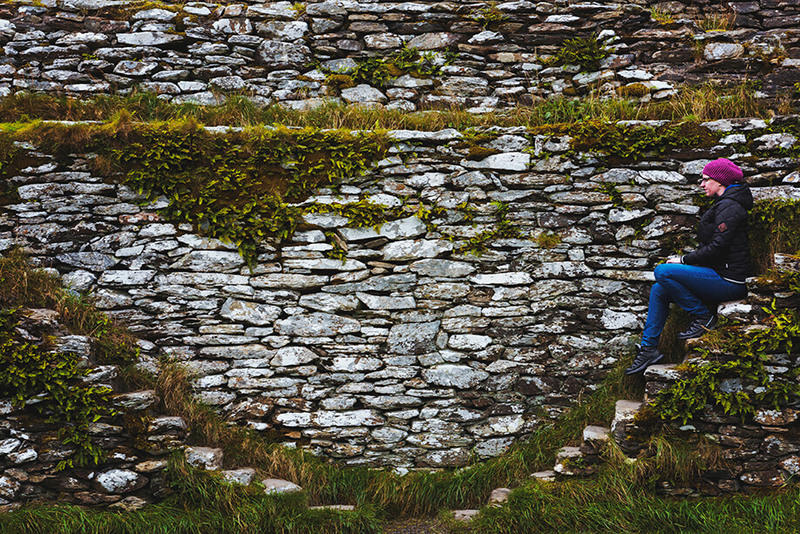 Photography tips, Ireland pointers and a few mishaps along the way. I did my best to just throw myself into the destination and really try to gain an understanding of what makes Ireland great. Although I love every place that I visit I have to admit to feeling a special bond with Ireland and would confidently say that Ireland got under my skin. Something about the history of the land just gets to you. I felt an intrinsic bond almost as soon as I landed and this feeling grew the longer I was there. As with all of my favourite destinations there was just a feeling of belonging, something unspoken and difficult to define. I hope you feel the same.